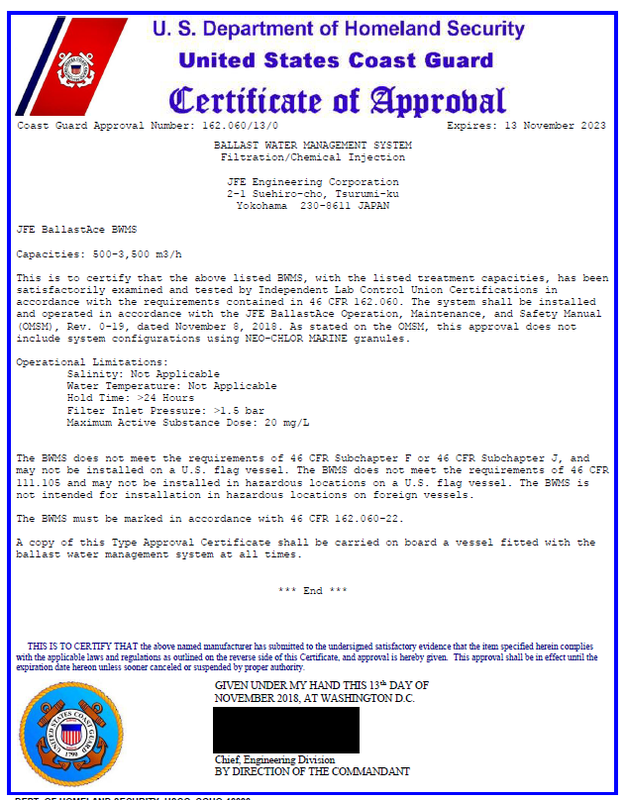 JFE Engineering Corporation is pleased to announce that its Ballast Water Management System, JFE BallastAce® has achieved USCG Type Approval on November 13rd, 2018. The approved BWMS is system configuration of Liquid Disinfectant, Non Explosion proof type. Approval of other system types such as Granular Disinfectant (NEO-CHLOR MARINE), and Explosion proof will be granted as amendment of the current certificate. JFE BallastAce®, the first USCG approved BWMS in Japan, is a combination treatment system of Filtration + Formulated Chemical Injection. It is free from the process of generating disinfectant additives on board, and ensures efficient sterilization in a wide range of salinity, turbidity, or water temperature. Furthermore, its extremely low power consumption assists retrofit of power limited vessels. JFE Engineering has been developing worldwide service network and aftersales service support system in these years. And it is sure that JFE Engineering continues enhancing the product and services referring to feedback from customers to provide better solutions. Copyright© 2017 JFE ENGINEERING Corporation. All Rights Reserved.